Many dry fruits, when mature, split open and release their (usually numerous) seeds. They are categorized mainly on the basis of the number of carpels, and how they split open. 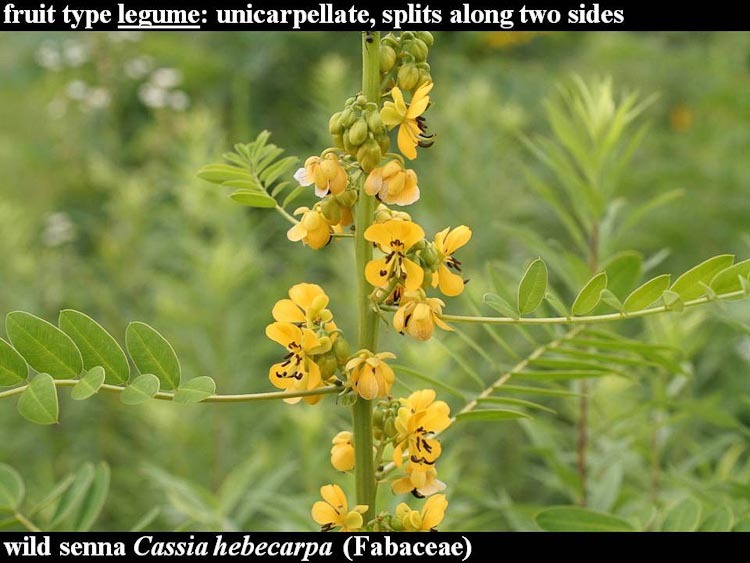 Below, wild senna. This prairie wildflower is a member of the pea (bean, pulse, or legume family), the fabulous Fabaceae. Its characteristic fruit type is a fairly simple one, the LEGUME, a dry fruit derived from a unicarpellate gynoecium that splits along 2 lines or sutures. MOUSEOVER the image to see wild senna in flower. 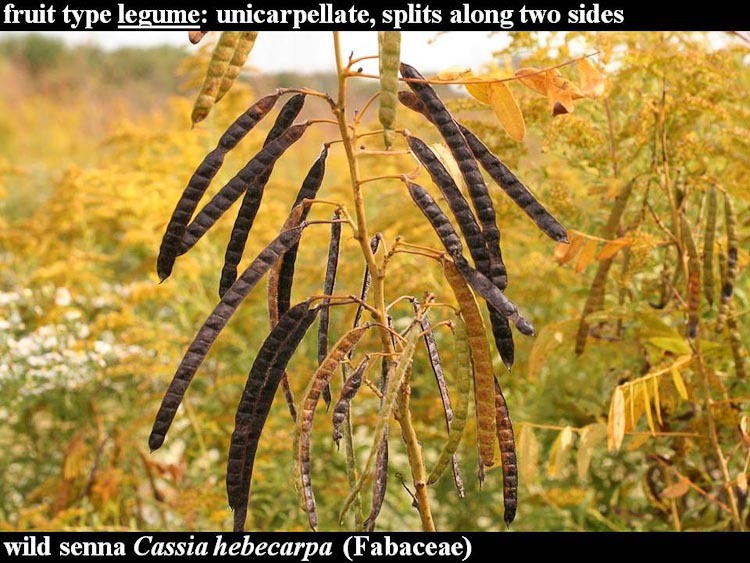 Wild senna fruits are legumes. Below, Sullivant’s milkweed. This is a fairly rare prairie species that is at the eastern edge of its range in Ohio (even though it was discovered here). 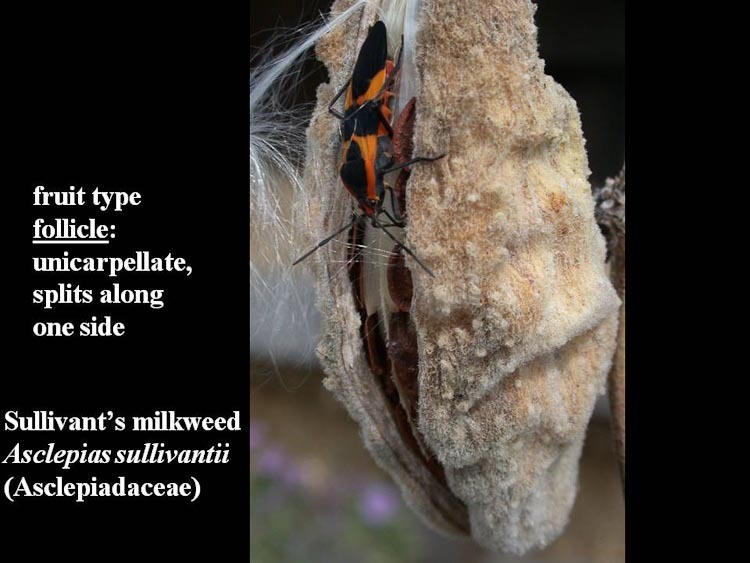 SLIDE the image to see Sullivant’s milkweed in flower (and pollinium circled). Milkweed flower anatomy and associated pollination ecology are special. The pollen, instead of being distributed as individual grains, is carried instead in bulk, as packets consisting of an entire stamen’s worth of pollen (two half-anthers each from adjacent stamens, actually). Called “pollinia,” the pollen packets are snagged inadvertently by bees or butterflies merrily sipping sweet nectar from the flower’s special bowl-like “hoods” and then carried saddlebag-like to a subsequently visited flower. Here’s a little video of honeybees enjoying Sullivant’s milkweed. Killdeer Plains Wildlife Area, Marion County, Ohio. July, 2010. Pollination occurs when a pollinium haphazardly dragged upwards across a flower happens to slip into a downward-facing groove, the stigmatic chamber. Once inside the chamber , the pollen grains grow, developing into hair-thin sperm-delivering tubes, each of which makes its way into an ovule within an ovary. 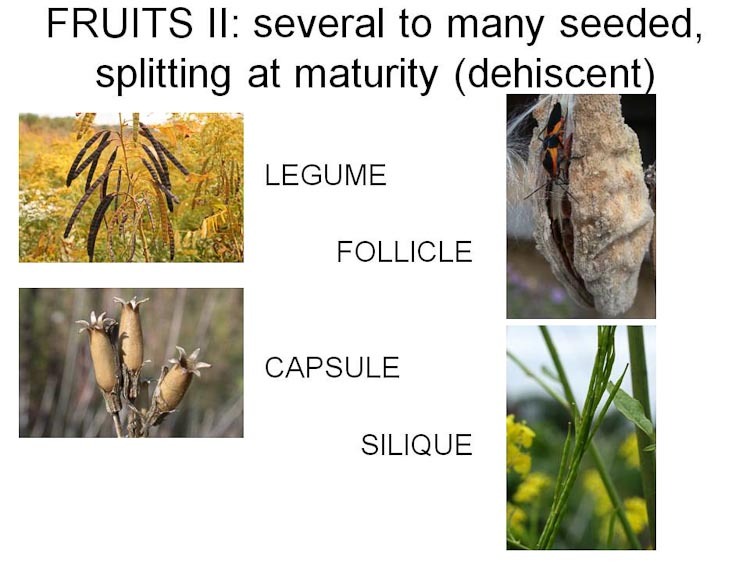 Thus it is possible (and believed typical) for all of the nearly 100 seeds in a fruit to be sired by the same male plant, i.e., the seeds in are “full sibs” (a fairly unusual circumstance, as flowers typically receive mixtures of pollen from many sources). Below, some details of milkweed pollination. Left: milkweed flower with pollinium inserted into the stigmatic groove. Right: cross-section of pollinated milkweed flower. As shown in the cross-section above, each milkweed flower has two ovaries. There are 5 stigmatic chambers; it is believed that 3 of them serve one ovary, and two serve another (perhaps with a little cross-over). Thus is is possible for a flower to have both ovaries pollinated and, if there are ample resources to support it, both ovaries may develop into follicles. Two fruits from one flower! Below, an example of such “twin” fruits (of a different species, common milkweed, Asclepias syriaca). Note that, on the left, the two follicles are attached to a single pedicel (flower stalk) whereas on the right, the two fruits are simply from separate flowers within the same umbel (flower cluster). Set of pairs of common milkweed fruits resulting from simultaneous fertilization of two ovaries. The most widespread dry fruit is the CAPSULE. Capsules are derived from a syncarpus gynoecium (more than one carpel) and they split open to release their seeds. Capsules can split in various ways and are often sub-categorized on that basis (picky-picky!). 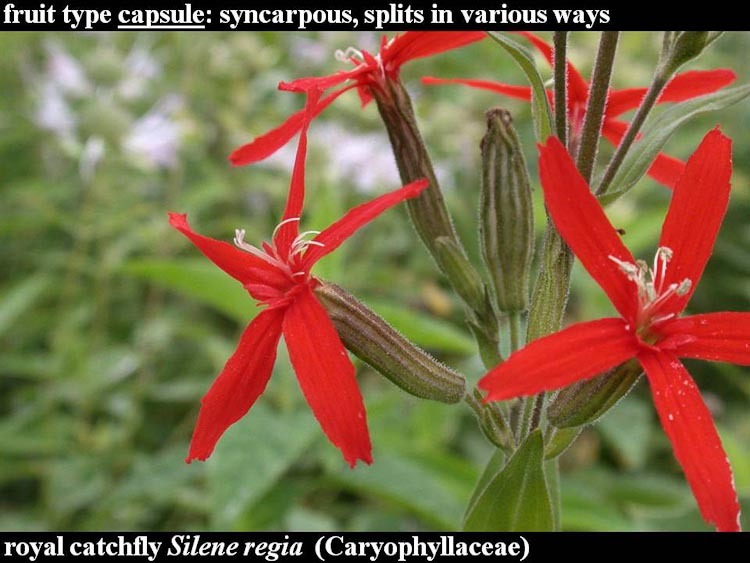 SLIDE the image to see royal catchfly in flower. 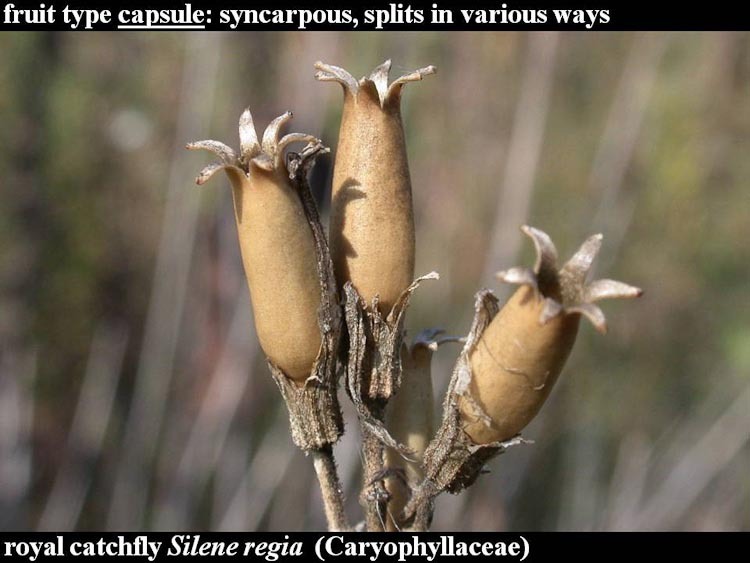 A SILIQUE is a special capsule found only in the mustard family (Brassicaceae). It doesn’t look so special, the distinction is internal. There’s a papery partititon inside that divides the fruit into two chambers that runs across the two carpels of which the fruit is composed. (Usually a partion separates the carpels.) 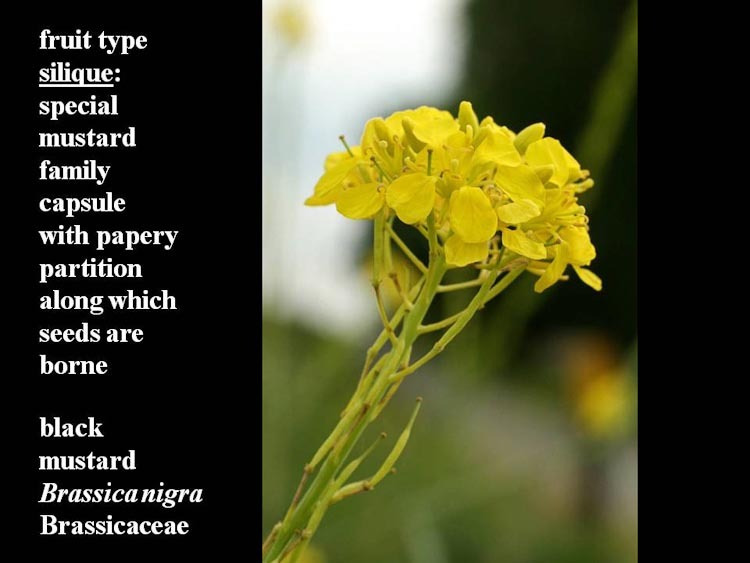 Below, behold black mustard. This common weed is actually the species from which the condiment is derived. 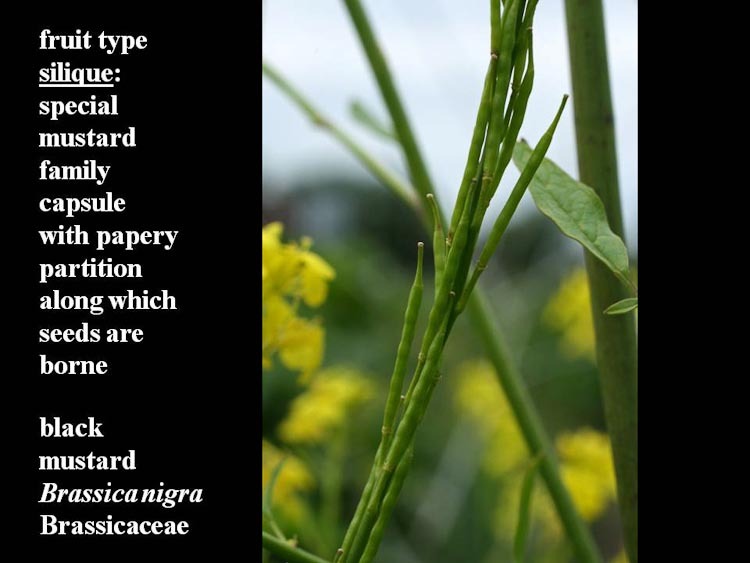 SLIDE the image to see black mustard flower. A mustard family fruit is a modified capsule called a SILIQUE .